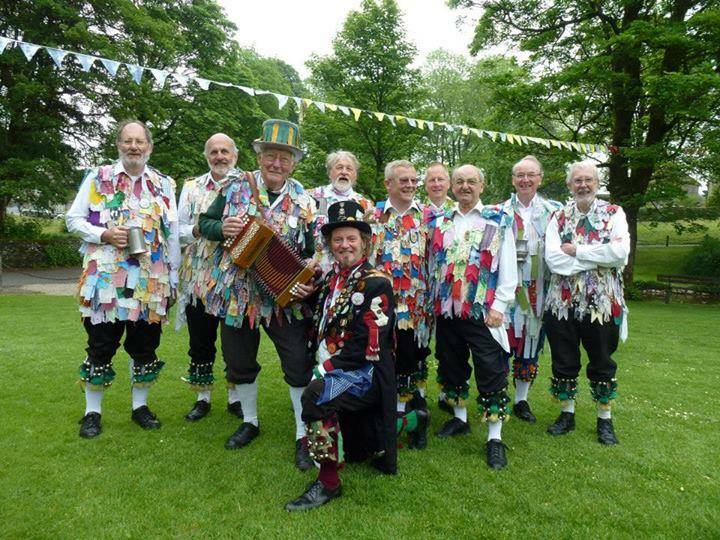 Like many Morris dance sides, the Forest of Dean Morris is what is known in the trade as a ‘revival’ side. That’s to say that the Side has been revived in an area where an earlier Side has died out . The Forest of Dean once contained many Morris sides as you can discover by reading our ‘History’ section below. The internet has proved to be a vast resource for researching our past, and you can ‘Google’ to find out more. But enough! Perhaps we’ve whetted your appetite and maybe you’d like to join us or at least come and watch so you can see for yourself what it’s all about. Can I join the Forest of Dean Morris? Contrary to what some of our photos may suggest, you don’t need to be male, grey-haired or bearded to join us. We have a number of enthusiastic lady dancers, and our membership ages have varied between about 15 to 80+ years of age. No matter whether you’re young or of more mature years you can come along to practice evenings and we can teach you to dance from scratch. You don’t need to be super-fit but if you are so much the better! If you can play a “squeezebox”, fiddle, or pipe and tabor you will also be welcome. Too far away for you? 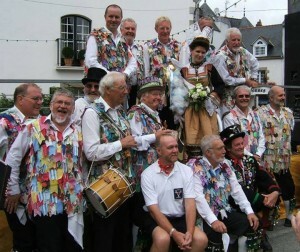 Don’t worry; there are other male, female, and mixed Morris sides throughout the country. We can help you to find and contact find a Side near you. 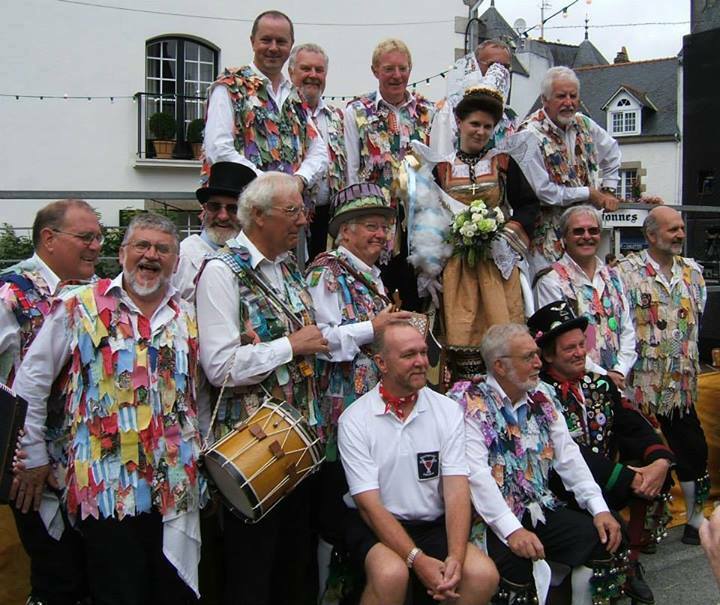 There are currently over 14,000 Morris dancers in the UK so there should be a side to suit you. From late September until the end of April we practice at The Miners Arms in Whitecroft, every Wednesday at 8pm. Just click on ‘Contact us’ in the menu and we can give you further details. During the Spring and Summer we dance out most Wednesday evenings at pubs in the Forest of Dean and Wye Valley. Over the years we have danced at countless fetes, weddings, shows, special events and even on Blue Peter! The Forest of Dean, as you might expect, had a Morris dance tradition somewhat different to the others. Although they dressed in “rag” and lived on the border with Wales they were not Border Morris. Their dances were also not quite like those often encountered in the Cotswold villages. An early record of dancing in the Dean is in The Torrington Diaries which record the tours through England and Wales of the Hon. John Byng (later 5th Viscount Torrington) between the years 1781 and 1794. On July 28th 1787 he was in Chepstow and wrote: “on my inquiring of Mr James, a local man, about harpers and Morris dancers, he inform’d me that the latter yet existed in the Forest of Dean whence they issued, as formerly, at Whitsuntide; with their wild looks, some wild manners, these will, probably, extinguish at the sale of the Crown lands”. Thirty-five years later another traveller crossed the Severn at Purton Ferry and on reaching the northern bank began to climb Viney Hill. On a small green near Blakeney he notices “a large party of rustics…. engaged in their Whitsuntide amusement of Morris dancing, and the appearance of the dancers covered with ribbons gliding at intervals through the vistas formed by the fruit trees, had a very pleasing effect”. As part of his research Cecil Sharp eventually came to the Forest but did not gather anywhere near the data collected elsewhere. He met a couple of old musicians and gathered a few tunes and some snippets of information about what was by then an extinct Forest tradition. The dancing appeared to have generally stopped around the mid 1880’s. Ruardean was the last traditional village team although there was a revival in Mitcheldean in 1900. Russell Wortley, of the Cambridge Morris Men, played a major part in re-establishing the Travelling Morrice’ tours after the Second World War. Russell was a fine musician who had a life-long interest in collecting dances and tunes. In 1925 &1934 he led the Travelling Morrice on a dancing tour of the Forest of Dean including a visit to the village of Ruardean. Wortley returned to visit John Penn, then living at Newport Mon. on 16.4.47 and Martin Penn at Ruardean in August 1946 and April 1947. He also visited Peter Ward of Joys Green on 26.8.46. All three had danced for the Ruardean Morris in the 19th century and were probably at their last performance in the Ross Area in 1884. Peter Ward was delighted to pass on what he remembered of the Ruardean dances. One month later he died. In 1972 Wortley corresponded with the Forest of Dean Morris and sent them information he had on the Ruardean dances. He paid a last visit to the Forest 1979 to meet the Forest of Dean Morris Men as the Side was then called. He died just a year later in 1980. In the last year of his life Wortley wrote an article for the winter edition of “English Dance and Song” entitled “The Morris of the Dean Forest”. For the 1959 September edition of the “English Dance and Song” he wrote an article on the “Bromsberrow Heath Morris Dances”. Bromsberrow Heath is not in the Forest of Dean (approximately 15 miles to the north) but one of the dances does have a Mitcheldean connection. It is evident that there were Morris Sides in Bream, Alvington, St. Briavels, Littledean, Lydbrook, Mitcheldean, May Hill and Ruardean and probably elsewhere. Lydbrook had been known as “a great Morris place”. For some reason Folk Music had a revival in the late 1950’s and 60’s. Whole new morris teams sprung up. In the 70’s women Morris sides formed. The first of which was the England’s Glory Morris Dancers from Gloucester. These female sides springing up caused a lot of controversy at the time as some of the more traditional male Sides saw it as women breaching one of the last bastions of a male world! Today all-female and mixed Sides are an accepted part of the Morris world. 1n 1968, Dave Blick was performing at the Forest of Dean Folk Club, based at The White Hart, Coleford. Dave had moved from Northampton, where he had danced with the Northampton Morris Men, to take up an appointment as Lecturer of mechanical engineering at the Forest of Dean College of Further Education. Dave, an eternal optimist, asked the folk club audience if “anyone was interested in forming a morris dance side in the Forest. Six men stepped forward and the Forest of Dean Morris Men was born*. David Blick was their first Squire. Morris dancing was once again revived in the Forest. The newly formed Forest side practiced throughout the winter and performed out for the first time on Easter Bank Holiday Monday 1969. Without any ‘Forest’ dances of their own the Forest of Dean Morris Men settled on a dance repertoire drawn from the Cotswold traditions of Oxfordshire and Gloucestershire. They also performed one ‘Border’ dance from Brimfield as well as the Bromsberrow Heath dance, (as danced by the Mitcheldean revival Side of 1900). In 1985 the Side developed the urge to dance “something different”. Over the winter David Wintle, the side’s Foreman at that time, ‘developed’ a few dances based on the skeleton notes taken by Russell Wortley of his meetings with the Penn brothers and Peter Ward. A letter from Russell Wortley to the Forest of Dean Morris Men describing the Soldiers Joy chorus is held in the FOD Morris Men archive. Other information came from that given to Maud Karpeles (an associate of Cecil Sharp). These ‘Ruardean’ dances were practiced through the winter. At the top of May Hill at sunrise on May Day 1986 the dance named “Soldiers Joy” was performed in public for the first for 102 years. It has become the tradition that at any performance ‘Soldiers Joy’ is always the first dance, as it was in the 19th century at Ruardean. May Hill, by the way, is the colloquial name for Yartleton Hill. The locals renamed it because of the tradition of dancing on the top on May Day (May 1st). Every May Morning Dancers Men from the Forest and Gloucester gather at the top to dance at Sunrise (5:20 am). (The above text is taken from a document written by long-standing Member of the Side, David Evans). *Note that the name of the Side has now changed to the Forest of Dean Morris making it open and welcoming to both male and female dancers.